Hopefully some updates coming soon once the trans is stripped down. I'm from Westbury-on-Trym, a sweet liitle village northwest (no, actually Northeast) of Bristol that postwar became a suburb. It was like growing up in Camberwick Green or Penny Lane.... There was a greengrocer, butcher, fish-monger, etc. Lovely place to be a kid and likely still is. We moved from there to Munich in the mid 70's, then back to Bristol for a year before coming to the US. That one year we lived in Clifton**, which is now VERY shi-shi, has always been beautiful with much sandstone Georgian architecture and, of course, Brunel's fanstastic bridge, the Zoo, the posh school. Haha, Rachel did raise an eyebrow at the part about Clifton - she'd already come out with "ooh, posh" before she read your "** Cotham" caveat, lol. And yes, absolutely, Vicky Pollard is one of the things she's keen to distance herself from! Her accent is nowhere near as strong; spent a little bit of time living in Essex and then latterly Kent, so perhaps has softened by virtue of that. Not much to update one since last week, I'm afraid. The transmission is now with the outfit on the Silverstone business park, awaiting a teardown to uncover what's wrong. I have to admit, I thought we'd be further along by now; in my mind this was last Tuesday/Wednesdays job, then to assess and get parts on order. Hoping to hear by the end of play today what the prognosis is. In parallel with this, however, I decided to go all-out and invest in a Guard Transmission "Club" level LSD, along with a billet differential cover. Which I do appreciate, is OTT for a road-only car, but to me it's a nice thing to have for any future owner in case they decide to do standing starts, or put slicks on there. Or both. And it'll serve as a great reminder of what's contained within, every time I jack the car up! I'm hoping that Mr Monson will be able to get that shipped today, so that we can build it into the transmission in a few days time. Can't wait to see it; when checking back through my emails to Matt (Monson), it was back in 2010 that I first reached out to him. This pre-dated me actually buying this car, and reading back through my diatribe, I think it must've coincided with another white 964T I had gone to look at (which the owner dicked me about on)...so...yes, nice to actually get around to buying a toy that I've had my eye on for almost a decade. I've cancelled the dyno day on the 25th - there's no way we can make that. Hoping we can still get to Northampton Motorsport on Friday 1st March though, for an afternoon (and evening?!) session. So a few pieces of progress news today. Firstly, an outstanding effort by Matt Monson in getting the LSD and billet cover plate shipped, it must've been the very second that the wired funds cleared into his bank, and was sent at the end of your public holiday on Monday. It arrived here in Blighty before 10am this morning. Not seen any photos of it yet, it went straight to Fearnsport. Thanks Matt. The transmission specialists have now stripped the gearbox. 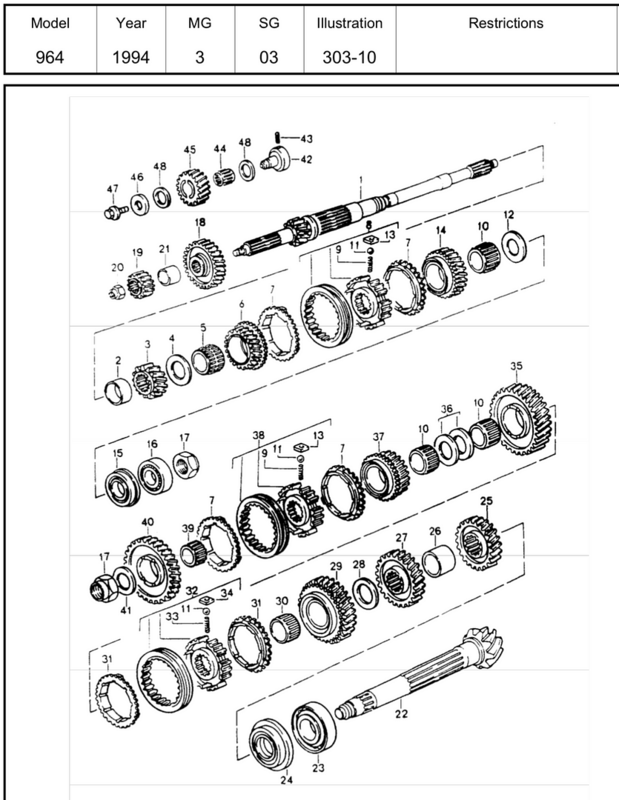 First findings show that there's axial and radial play on the lay shaft and the pinion shaft, requiring both of the bearings to be replaced that sit in the "tensioning plate". This plate also apparently needs to be replaced to remove the thrust play.....I'm certainly no transmission expert but having watched a few videos of 915 rebuilds, isn't the shim (Item 26 below) that sits behind the tensioning plate used to dial out any end-float? 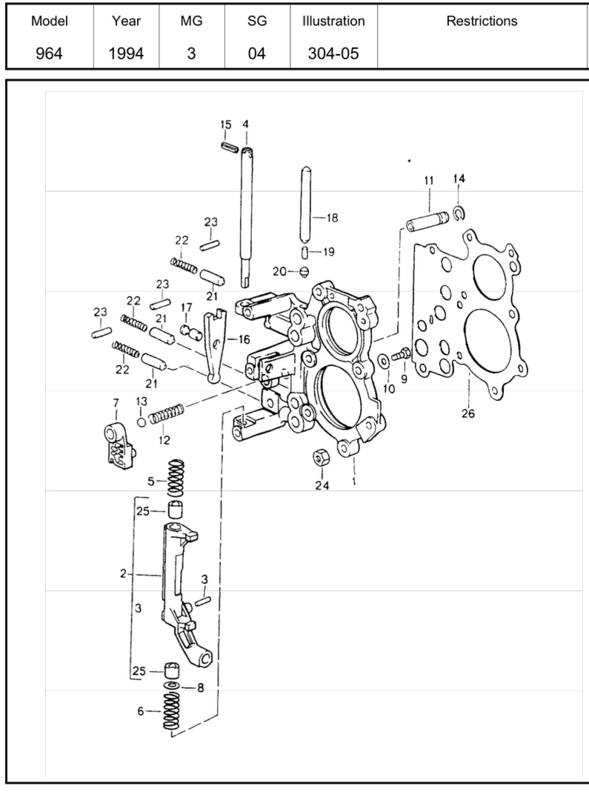 If anyone here has experience of this, please let me know asap...a new plate (Item 1) (>$700, likely the same in GBP) is about to be ordered from Germany. Both the 4-point bearings I think are in UK stock; hoping these are Items 15 and 24...in which case they're the slightly cheaper ones, £307 + VAT & £142 + VAT respectively. Not going to skimp on trying to source pattern parts, genuine all the way for this exercise. Just hoping that the other pair of bearings aren't also needed (#16, #23), they're £427 & £410 respectively! Also, no word yet on condition of the synchros, but I can feel slight notchiness on 2nd-3rd shifts, so am anticipating this will need attention as well. In re-reading back through this thread (I knew it'd come in handy one day), I've also noticed a faux-pas on my behalf. During Build #1, I timed the cams up to 1.36mm at 0.1mm lash, ie., the factory timing of 1.26mm + 0.1mm tolerance they allow. For some reason, on Build #2, I timed to 1.26mm. No idea why, and upon speaking with Chris earlier, this is likely to give a few more top end bhp, but at the sacrifice of low end torque. Moving to 1.36mm will lose me a few hp but for a road build, the additional low down torque will be more appropriate. Fearnsport are re-timing it, while the engine is out. I'm hoping to get up to Silverstone on Monday to watch the transmission being rebuilt - I want to actually eyeball what I've just spent £3k on with the new Guard diff and cover! Besides, I find transmission rebuilds fascinating to watch, having never attempted one myself. Last edited by Spenny_b; 02-20-2019 at 12:46 PM.. Thanks Fred! Yep, I'm VERY much looking forward to getting her back, all mapped and ready to go. The tensioning plate is on order with Porsche Germany, the bearings are on their way already I believe. Thankfully it was just the 2x bearings I hoped for yesterday. Upon speaking with Matt about whether the end-float could be removed by using a different thickness shim, apparently no, it's not just the end float we're fixing here, the plate itself is damaged! How on earth that's happened, I have no idea - some ham-fisted previous owner perhaps? Thankfully it's come in quite a lot cheaper than the $700'ish I investigated the other evening (which by the time you fly parts over here, exchange rate and import fees, usually works out the same number, just in £'s, i.e., £700); it looks to be coming in at just over £400. Two new synchro rings also required, 2nd and 3rd gears...this backs-up my thoughts on it feeling notchy when going between the two. All-in-all, it should feel SIGNIFICANTLY different as a transmission to drive. Cam timing is now reset back to 1.36mm. The ID injectors are removed ready for cleaning next week. Matt is having another go at fixing the persistent exhaust blowing at the header flanges. This is a perennial issue every few weeks, where one of the fixings works its way loose. Time to bin off the copper nuts and go for proper K-nuts. New 044 pump is with Fearnsport, and being fitted as we speak. If the old one does turn out to be ok with a thorough clean, then I'll keep it as a spare. So long as the parts from Germany arrive swiftly, then we should still be ok for the dyno on March 1st. I'm also still planning on going up there on Monday morning to have a look/see. Happy for you Spencer, it’s going well! Hi Spencer... any new news...?? Hi Bob....hmm, yes there’s plenty to write up, unfortunately none of it good news, other than the transmission is now rebuilt and ready for installation. The rest? Well, yet again, wishing I’d never started this stupid project. Hang in there Spenc...!!! You are soo close to competition AND your build spec is incredible...!! Let me know if I can do anything to help...!! Not the morale either for me Spencer, the electrician who looks after my car has gone into depression, I really have no luck, because of it my car gets stuck. Spencer, you have to ignore the bad things and take the positive, that’s what I’m trying to do for me, you have to support yourself, don’t let go!